As our first graduates are going on to launch successful careers in the live events and entertainment industries, here is a topical success story in advance of this weekend’s live X Factor Final. Chileleko Osazuwa from Plaistow, East London, completed her Level 4 Diploma at the National College in July 2017. Now, she’s building up her experience working with award-winning production crews for live shows – including the high profile X Factor live programme. Chileleko explains how completing our course has given her the knowledge and networking skills she needed to break into the industry. I do feel special to be among the first students for a brand-new college. My one-year Level 4 Professional Technical and Production course was intense, but I learned such a lot. When you’re on a work placement you get treated the same as everyone else, not like a student. It’s a real taste of working in the field, and it has the same fast pace. I’d always heard that you need to know someone to get in and networking is one of the skills you get taught at the National College Creative Industries – how to do an elevator pitch, how to talk about yourself in an interview – really valuable life skills. During my course, I was given the opportunity to work on a pilot series that was filmed at the Backstage Centre. As I am interested in filming, I naturally gravitated towards working alongside the camera crew. I assisted with the jib (a camera on a crane) and I helped out the camera assistant with the cables, making sure they didn’t get tangled or caught under the wheels of the tripod (ped) which would prevent the camera assistant from moving and the operator from getting the required shot. Everyone on set was willing to help me learn and once the session was over I exchanged details with the crew. Just one week later I was asked if I would like to work on Celebrity Juice. The show involves the camera crew having to run around corners and I assisted with a hand-held camera. My role was to ensure there was enough slack for the operator to move around and to feed the cable back when he was returning into the studio without being seen on screen. On the back of this I had a further opportunity to work on the Mercury Prize award rehearsal and live show which has led to my most recent and perhaps the most exciting opportunity! I am currently working on the X Factor live shows, which has been an amazing experience. Each weekend it’s incredibly exciting to hear the live feed in my ear from the director, communicating to all the backstage crew on talkback (radio). The things I learned on my course and saw in practice at the Backstage Centre, I now get to work on and see how it all comes together on a much bigger scale. I work with the lighting technicians, stage crew, director, creatives & floor managers in action. A daily call time for the assistants is set a bit earlier; this is to make sure everything is ready to start on time for rehearsal/ live shows. I work with the camera assistant cleaning lenses, locking the peds, and changing long lenses among other tasks such as sorting and tabbing the music cards for the camera operators to ensure the shots of the contestants are taken in the right order. Some of the operators have been giving me mini lessons in how to operate their cameras, including tracking and zooming in. It’s been nerve-racking as the new kid on the scene, but the crew have been more than willing to show me the ropes. As they are recognised as the UK’s leading crewing agency for freelance broadcast television, having won BAFTAs for Strictly Come Dancing and Ant and Dec’s Saturday Night Takeaway, it’s really given me confidence. 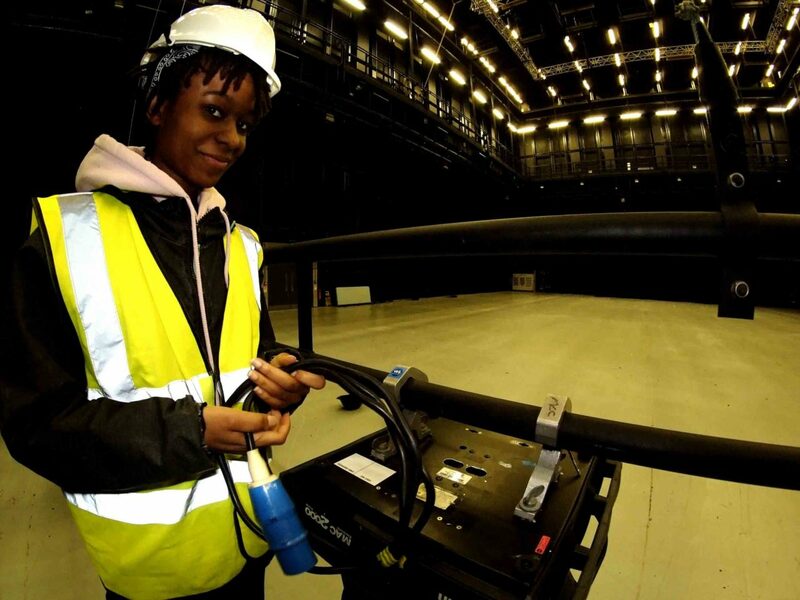 Some of the entertainment/broadcasting providers they work with are the National College’s founding employers such as the BBC, National Theatre and The Royal Opera House. I am confident that my placements while studying at the National College Creative Industries along with the additional industry experience gained whilst working on the X-Factor have given me transferable skills which will be invaluable to my future career. I hope to work with the X Factor production crew again, continuing to grow and further my knowledge and skills within this industry. I am really excited for my journey ahead.